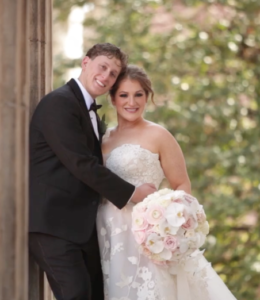 An abundance of happy tears flowed throughout Crystal and Giuliano’s wedding day. After preparation at the Hotel Monaco, the couple relocated to the Ballroom at the Ben for their ceremony and reception. They vowed that the day was not about starting a new life, but strengthening the bond they already had together. During the reception, no one got through their speeches without shedding a few happy tears. Everyone genuinely adored the couple and their decision to come together as husband and wife. In celebration, family and friends danced the night away with the newlyweds to entertainment from DJ Sat-One. As the dancing ensued, flashing lights and sparkling towers made the reception even more exciting. Our Allure Films team was honored to film this day, especially since we were able to work alongside our talented friends from Philip Gabriel Photography. It is easy to capture true love like that between Crystal and Giuliano. We wish them so many more exciting days together. Allison had only known Ross for about two weeks before telling him that she was leaving for Kenya to finish up some research. Ross was not about to give up and let this amazing woman slip out of his life. When you find “the one,” you can’t let them get away! Ross booked the first flight to a continent he had never been to just to see Allison and the rest was history. Just a few years later the couple said “I do” at Philadelphia’s Down Town Club. 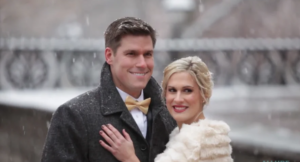 If we could describe Allison & Ross’s wedding in one word, it would be “magical!” Allison and Ross got married on a day when the city looked like a winter wonderland. The Allure Films crew started our day documenting the couple’s wedding prep at the lovely Hotel Monaco. Following the wedding prep, our crew got to film (here comes that word again) “magical” moments of the couple meeting each other outside as snow was falling from the sky. Ralph Deal Photography took some beautiful photos of the couple together during this time as well. It is always an honor and a blast working with this photographer! Both the ceremony and the reception were held at the Down Town Club. The decor at the reception will make Harry Potter fans geek out when they see it in the wedding preview. The guest table seating cards were themed off of the sorting houses at Hogwarts. Instead of opting for tradition floral centerpieces, there were golden replicas of the whomping willow trees with tiny lanterns on the branches. And how about that wedding cake decked with a super cool flying dragon detail?! As the night went on there was lots of dancing to popular tunes spun by BVT Live‘s DJ Gaetano Basco. Allison & Ross, may your future as husband and wife be filled with plenty of love, magic, laughter and Happily Ever After!